Sadly, this is one of the lies that the devil can use to completely distract us from the direction and plans that God intends for us. Why would I say that? Think of Job. Here was a man who literally lost everything but his life and his wife, and even she was telling him to just die and get it over with. He went from being healthy and wealthy, having a close knit family of ten children, to sitting in an ash pile scratching his boils with a bit of broken pottery, mourning the death of all ten children and everything he owned, and with his wife telling him to curse God and die. On top of this his three friends who were his peers were telling him it was all his fault and he deserved it. The truth is, God was the one that started the whole process by pointing out Job’s righteousness to Satan! Then God allowed the devil to do all those things to Job to prove Job’s love and faithfulness to Himself. None of this had to do with Job being wicked or deserving it. Quite the opposite was true. Things definitely were not “MUCH easier” because God was behind it. In fact, it was MUCH worse because God was behind it. It is so easy for us to decide that something is or isn’t from God based on how easy it is for us. It is also so easy to judge other people, like Job’s three friends did, because it seems to us that they must be going through all that trouble as punishment for something they did wrong. We need to be so careful of this! The Lord had some hard words for Job's three friends that judged him so harshly. Job 42:7-8 And it was so, that after the LORD had spoken these words unto Job, the LORD said to Eliphaz the Temanite, My wrath is kindled against thee, and against thy two friends: for ye have not spoken of me the thing that is right, as my servant Job hath. Therefore take unto you now seven bullocks and seven rams, and go to my servant Job, and offer up for yourselves a burnt offering; and my servant Job shall pray for you: for him will I accept: lest I deal with you after your folly, in that ye have not spoken of me the thing which is right, like my servant Job. There also seems to be an influence of the animistic idea that we can make our lives more livable and pleasant by appeasing the spirits. We see this in the way many Christians seem to think that if they do certain “good, godly” things, God is obligated to bless them. Then, if someone doesn’t receive the blessings they have allegedly “earned,” the assumption is that they must be doing something wrong. Often times it’s just the opposite. The Bible tells us that "...all that will live godly in Christ Jesus shall suffer persecution", not live a charmed life (2 Timothy 3:12). Instead of acknowledging and believing this, too many Christians seem to think of Christ as their lucky charm - He will make everything work out for them, or if something is "of God" it will automatically work out. This then plays out into thinking like the statement above - that things will be MUCH easier if God is behind them, or that if things are hard, they must not be “of God” or you must be "out of God’s will." This leads to making decisions based upon whether or not things are "easy," and determining one's relationship with God based on whether or not "bad things" are happening. My great-uncle, Bill Ebeling, and his wife, Bea, were missionaries in China when the Communists took over. My Aunt Bea and their children were eventually permitted to escape to Hong Kong, but her husband was put under house arrest at the Hunan Bible institute where they had lived and worked for about 4 years. He had to listen to the Communists teaching their propaganda and indoctrination in the classrooms where he and his fellow workers had been teaching the word of God. I believe at one point he was ill and I know that all the work he had done for his doctorate was destroyed by the Communists. His wife waited about a year for him to be released and finally the decision was made that she should take the children and head for England. During this time, back at his home church in Michigan, my great-grandmother was much provoked by some of her fellow Christians because they concluded that the reason her son was suffering all this was because he “obviously” was “out of God’s will” or had done something to deserve it. Yes, there he was suffering persecution for the Gospel’s sake, and his fellow church members back home were accusing him of being punished for his sins. My great-uncle was released shortly after his wife and children left on a ship, but he was able to catch up with them in England. They were naturally very thankful, but what about those who had judged him? They probably just went on their way, with or without realizing how unjust and merciless they had been, and how presumptuous to assume they knew the Lord’s reasons for what happened. An opposite instance happened to my dad once. He had graduated from high school at a missionary boarding school in Kenya and then spent a year working with his parents. Then he came back to the States from East Africa for college. He was in need of a suit so some family members took him shopping for one. As it turned out, they found one that fit on sale for a good price. The lady’s comment was, “Well, we must be living right.” My dad knew that wasn’t true, as the man was an alcoholic and these people didn’t make any genuine effort to live as Christians. He knew also that it wasn’t because he “deserved” it, but that it was just a blessing from the Lord, undeserved, gracious, and kind. So many things in life are just that - undeserved blessings. Why do we insist on making it a reward for our “goodness” or “obedience”? Maybe it is sometimes, I don’t know. But we have no right to interpret it that way, especially knowing the deceitfulness of our own hearts and of sin. Hebrews 3:13 But exhort one another daily, while it is called To day; lest any of you be hardened through the deceitfulness of sin. Job obviously didn’t take his blessings that way during the earlier years because it clearly tells us that he was greatly disturbed about the possibility of his children having committed sin. Assuming that things are all caused by us and our behavior is self-focused, as is the heathen manner of thinking. It makes all that happens dependent upon us and it makes us the defining principle in our lives, when as Christians it should be just the opposite. Rather than focusing on everything as God either blessing us for our goodness or punishing us for our sins, we should see everything that happens as for His glory and for His will. 2 Corinthians 4:15-18 For all things are for your sakes, that the abundant grace might through the thanksgiving of many redound to the glory of God. For which cause we faint not; but though our outward man perish, yet the inward man is renewed day by day. For our light affliction, which is but for a moment, worketh for us a far more exceeding and eternal weight of glory; While we look not at the things which are seen, but at the things which are not seen: for the things which are seen are temporal; but the things which are not seen are eternal. The problem with people trying to determine what is going on in the lives of others when their thinking is influenced by the superstitious tendencies of mankind is that they will blame or praise others where God is not blaming or praising. And, ultimately, that is what it is - superstition. The idea that we can get God to perform for us if we “live right” or perform the right acts is superstitious. Believing that if things are going badly for no apparent reason, we must be being punished is essentially superstitious also. Sometimes the Lord does put up roadblocks to stop us from doing things or going places that are not His will for us. So how do we tell the difference? In the case of Job he couldn’t know. But there was something he could have done. He could have refused to answer or even listen to his accusing friends, and he could have refrained from justifying himself. In the end the main thing that God impressed upon him was that he didn’t know what God was doing. When the Lord spoke to Job personally, it was about all the many things that Job didn’t know about the ways and methods of God. This is something we need to take to heart. We are just as ignorant of the ways and thoughts of God. Isaiah 55:8-9 For my thoughts are not your thoughts, neither are your ways my ways, saith the LORD. For as the heavens are higher than the earth, so are my ways higher than your ways, and my thoughts than your thoughts. There is also the principle of reaping and sowing in the scriptures, and likely this is something that has confused many of us at times on this subject. Sometimes things certainly do happen that are a direct result of our own sins. But, I think these things are generally more obvious. I knew a person who died in a car accident while driving drunk. He was reaping what he sowed. Another lady had a child with disabilities because she used drugs while she was pregnant. She reaped what she sowed. A mother who spoiled her son and shielded him for proper discipline and training had the grief of seeing him choose to live a very sinful life. She reaped what she sowed. You see what I mean? Some things are more obvious, but on that last one we cross into more difficult territory. After all, some parents who try hard to raise their kids in the ways of the Lord still have them turn out poorly, as did the prophet Samuel in the O.T. His sons were not godly like their father, and yet God never blamed him for that, while earlier He had severely judged Eli for not properly rebuking his sons for their wickedness. Judging from the outside is dangerous business because we don’t even know all the internal details of a situation from a human perspective, let alone from God’s. Let’s not assume we know what God is doing, unless we have very good reason to do so. 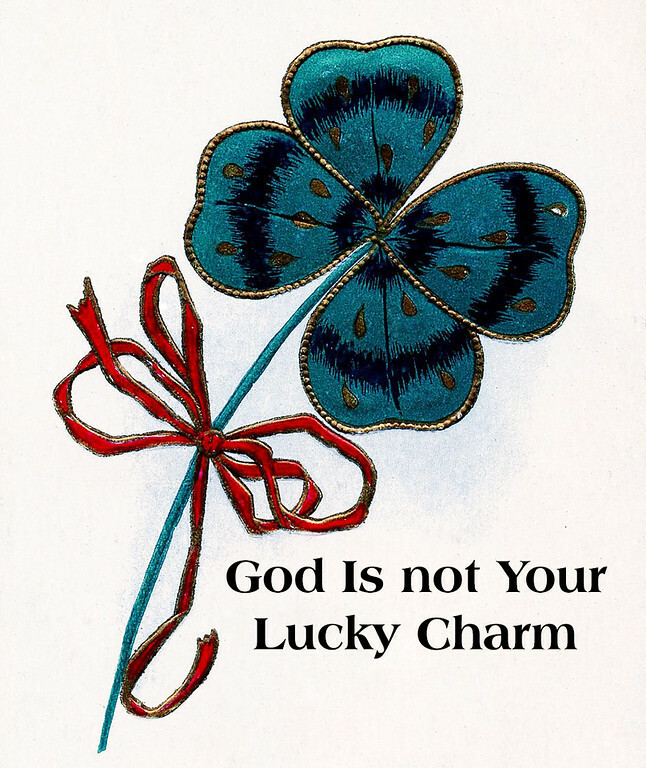 And, let’s especially not treat the Lord as our lucky charm. Let’s not think that we can make Him bless us by our behavior, and let’s not think that we or someone else is automatically “naughty” just because things don’t go well by our human standards. Whether or not something is "easy" does not indicate that God is behind it or not behind it. There are plenty of examples of all types of situations. When we make assumptions based on this type of faulty thinking, or even superstition, we leave ourselves open to be deceived by the devil or our own sinful selves, and we make God small in our own minds. It is an easy thing to fall into, and so it is important to guard against it. Philippians 4:6-7 Be careful for nothing; but in every thing by prayer and supplication with thanksgiving let your requests be made known unto God. And the peace of God, which passeth all understanding, shall keep your hearts and minds through Christ Jesus. Some excellent examples! Your family certainly has a background in mission work - wonderful heritage! I thought of a song as I read that always bothered me. The one from the Sound of Music, You Must Have Done Something Good - Maria sings it to the Captain basically telling him that he'd done something to earn her love and other blessings in his life. NOT! It's a lovely tune, with no truth in the words! Thank you for sharing from your own family history and from God's Word! Thank you, Denise. I'm so glad you were blessed here and that the post made you think. I didn't remember that song from the Sound of Music. You are right about it. When I was in my late teens and twenties I tried so hard to be a the best Christian that I could because I had this idea in the back of mind that I needed to prove to God that I deserved a husband. It was such an unbiblical way to think, and it didn't answer either my needs or my desires. It was so self-conscious and self-focused. :-( I had to go through some things to have that knocked out of me. Thank you for taking time to read and comments. Thank you for reading and commenting. I am glad that you were edified here. Wise words, Mary. These things can so easily trip us up in our walk with God. Jesus promised us His presence and peace but He also said we would have trouble and persecutions in this world. Neither our salvation or our blessings can be self-fulfilled or earned by our behaviour. All is gift. All is grace. And all our problems and pain are made bearable by knowing they are also shaping us into greater Christ-likeness. Thank you for this insightful and timely word. I'm blessed to be your neighbour at the #graceandtruth link up! Thank you for your kind words and good observations, Joy. I'm glad that you were blessed, and I thank you for stopping by to read and to comment. Hard Questions: What Is Your Red Hot Center?